GLENDALE -- The Coyotes and Gila River Casinos on Wednesday officially announced the team's new home rink in Glendale as Gila River Arena at a mid-day outdoor press conference. "This is an exciting day for us," said Anthony LeBlanc, the team’s Co-Owner, President and CEO. "It's the culmination of many months working to ensure that we have a naming rights partner that we feel proud of. We feel that we can help each other... When we took ownership, it became evident that they were really the group that we wanted to work with to put their name on our building." Gila River Casinos already was a valued business partner of the Coyotes; the nine-year arena naming rights deal – and the corresponding enhancement of their existing sponsorship agreement – was born from that relationship. 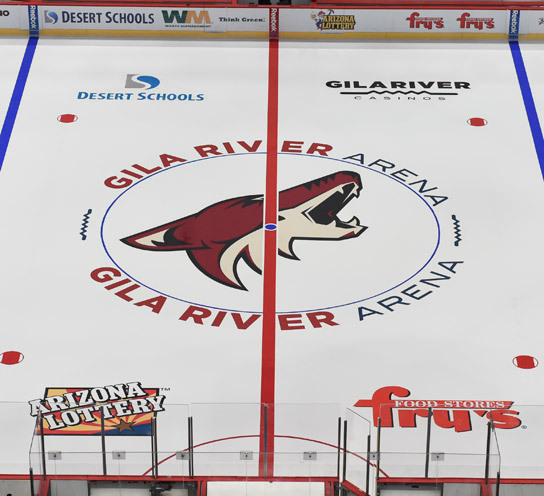 "The Gila River Indian Community is not just a big sponsor of our hockey team, they're also a large sponsor of the (Arizona) Cardinals and the (Arizona) Diamondbacks, so the fact that they've decided that we're the facility that they wanted to partner with in the biggest possible way is something that we're incredibly proud of," LeBlanc said. LeBlanc said the outdoor signage for Gila River Arena has been ordered and the goal is for it to be in place by Opening Night on Oct. 9. The Coyotes were allowed to end their 10-year deal with Jobing.com as a condition of IceArizona's purchase of the team last summer. The Glendale City Council approved changing the name from Jobing.com Arena to Gila River Arena on Tuesday night by a vote of six to one. This agreement is the first naming rights deal for Gila River Casinos and the first federally recognized Tribal naming rights deal with a sports venue that houses one of four major professional sports leagues in the country. "This is a first for any tribe in the country or in North America," said Gila River Indian Community Governor Gregory Mendoza. "It's very significant... This area where we're at is the ancestral land of my ancestors so, of course, this is a very special time for our community. It brings pride to our people. This significant agreement is a milestone for us." 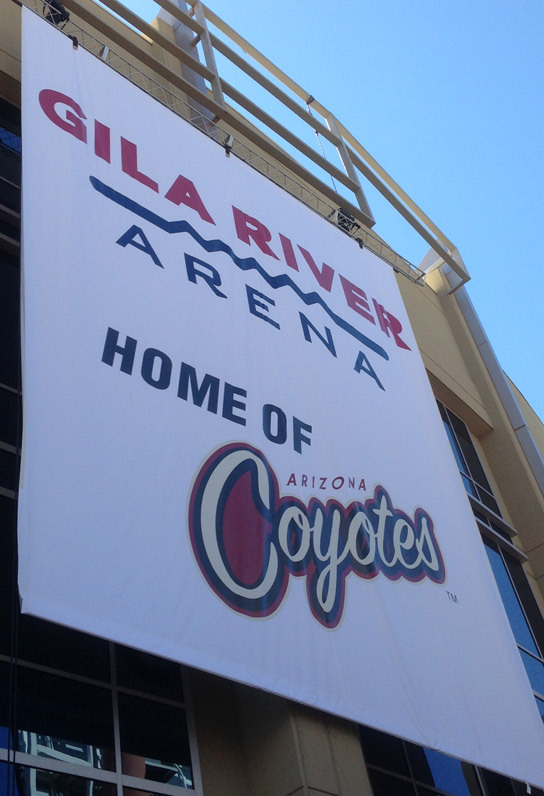 Owned by the City of Glendale, Gila River Arena opened as Glendale Arena on Dec. 26, 2003. Other luminaries who attended the press conference included Arizona Governor Jan Brewer, Glendale Mayor Jerry Weiers, Coyotes Head Coach Dave Tippett, team captain Shane Doan and goalie Mike Smith. EDITOR'S NOTE: Click here to watch Wednesday's press conference in its entirety.